It still surprises me that authors, creators, musicians, you-name-it … all those people who are responsible for the existence of the final product in the first place, all of them get the short end of the stick when technology eliminates friction from any market. Does it always happen like this? Does anybody have examples of a market where more money ended up going to the authors proportionately than to all the other middle-man? 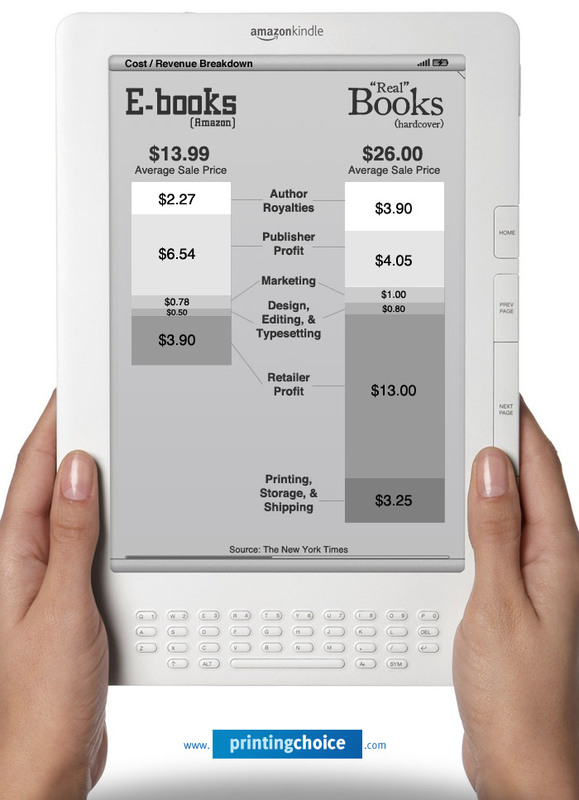 The particular visual is cute and all, displaying a stacked bar chart inside a Kindle. Wasn’t the Internet going to democratize publishing? Wasn’t it going to become the “new printing press”? How long until we don’t need a group of people telling us what to read while charging us a hefty size of the proceeds at the same time for it? Oh this is kind of depressing… I could argue–that in some cases at least, the author (or artist) can get more out of the digital format. Take Seth Godin for example. He’s opted out of ever publishing traditionally again–and he’s a prolific author. He’s decided he can do better by selling directly to consumers through his website, and will, therefore, make quite a bit more profit–even if he sells less. Thoughts? Funny you should comment now after so long since I wrote this entry, as just last night we where talking about this very topic over dinner with Rose & Andy.